First started in 2008 to combat the fall of physical record sales resulting in an accelerating closure of independent retailers around the world, Record Store Day returns for its eleventh year offering a whole host of rare records to get fans and collectors excited and inspire them to head on down to their local shop and support it. 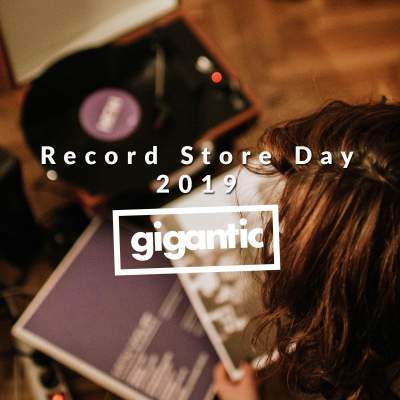 In addition to all the special limited releases on offer, celebrations will include instore performances, talks, workshops and DJ sets getting everyone in the party mood. Gigantic brings you a list of some of the best 12” and 7” that will soon be flying off the shelves this weekend. Not only can you get your hands on something truly special, but we also offer you tickets to see some of the very best acts performing the crucial songs live. Good luck fellow vinyl fanatics, and happy hunting! Later in the year, Glaswegian duo Honeyblood will be releasing their highly anticipated third album ‘In Plain Sight’. ‘The Third Degree / She’s A Nightmare’ is the double A-side 12” taken from their upcoming record featuring a sleeve for both singles illustrated by long-time collaborator Chrysa Koukoura on either side of the cover. They promote ‘In Plain Sight’ with a tour which starts at the end of this month. Honeyblood tickets are currently available. BRIT Awards Critics Choice winner Sam Fender releases his politically charged single ‘Play God’ on 7”. On his new single, Fender takes a critical look at the Western powers aggressive foreign policy and the resulting violence that spreads across the Middle East and the negative consequences of pushing neoliberalism on the world. It also includes a live version of ‘Hypersonic Missiles’ as a B-side. Sam Fender tickets are currently available. The Flaming Lips always find their own way of doing things. Whereas most show their support for independent record shops by re-releasing a fan favourite single, a classic album that deserves to be heard on vinyl or curious oddity that gets the avid collector frothing at the mouth; Wayne Coyne and co. have chosen to drop an entirely new album! ‘King’s Mouth’ is inspired by Coyne’s immersive art instillation and contains 12 original tracks on 180 gram gold vinyl plus a companion book. The Flaming Lips tickets are currently available. In 1974, psychedelic rockers Hawkwind were having a bit a of a tough time due to poor record sales and little love from the music critics. Undaunted, the band self-financed their own tour of the States under the name of The 1999 Party. It would prove to be a turning point for Hawkwind who would then release ‘Hall Of The Mountain Grill’ later that year – seen by many as one of their creative peaks. Formally released on CD in 1997, ‘The 1999 Party - Live At The Chicago Auditorium 21st March, 1974’ will be brought out on x2LP for Record Store Day. Hawkwind tickets are currently available. It is going to be a very good Record Store Day for fans of Kate Stables’ enigmatic brand of folk rock as she releases not one but two of her best records. 1000 copies of This Is The Kit stunning debut album ‘Krulle Bol’ will be released on blue vinyl plus only 700 copies on splattered orange and blue vinyl copies of her breakthrough record ‘Wriggle Out The Restless’ will be made available. Also, do not miss her made a headline performance at O2 Academy Oxford on Thursday 15th of August. This Is The Kit tickets are currently available. Having pioneered the Britpop movement only to succumb to the very addictions and decadence they so eloquently wrote about, Suede came close to burning out a disappearing as a casualty to their own excess. Somehow, they were able to return to the studio and create ‘Head Music’ – their third album to hit No.1. This x3 LP on white 180 gram vinyl includes 10 B-sides. Suede tickets are currently available. Returning to her 2008 album ‘In The Court Of The Crimson Queen’, Toyah re-imagines the record with remastered versions of the tracks, added instrumentalism, new artwork and on vinyl for the very first time! Toyah will be appearing at Rock And Bike Fest 2019 plus joining the fantastic roster of acts on the Let’s Rock – The Retro Winter Tour in addition to playing her own headline dates throughout the year. Toyah tickets are currently available. Blasting back from the 90’s, everyone was thrilled with the return of Britpop champions Sleeper who reunited in 2017 and proved as vital as ever with the release of their new album ‘The Modern Age’ earlier this year. ‘Live At The Ritz’ captures the energy of the band and the excitement of the audience at their recent Manchester Ritz gig by including performances of classic tracks plus new material. Sleeper tickets are currently available. Bluesy duo Ferris & Sylverster release a 12” double A-side of two of their most powerful songs; ‘Sickness / Burning River’. Discovered by the legendary presenter Whispering Bob Harris who made them one of his main acts for his Under The Tree tour where they will be joined by Wildwood Kin plus an assortment of excellent acts which kicks off this month. Ferris & Sylverster tickets are currently available. Described by The Wedding Present as their single that never was, ‘Davni Chasy’ has been remastered and is now released as a 7”. This year sees the band from Leeds tour extensively, playing dates across May and June before celebrating the 30th Anniversary of their seminal second album ‘Bizarro’ with gigs scheduled in October and December. The Wedding Present tickets are currently available.